Moving files around on your system can really throw Lightroom for a loop. However, have no fear! We can fix this error in just a few seconds. First, a little background. After you get images in a catalog, Lightroom can’t follow your images if they get moved. You might hit this error message because you renamed a folder, moved it inside of another folder, or anything that changes the path of the files in Lightroom. This message will show when images get moved around on your computer and Lightroom can’t find them. Easy fix, no worries. All that we need to do is show Lightroom where we moved the files to. In the Library Module, look down at the Film Strip (the row on the bottom with photo thumbnails) and click the small box over the thumbnail. Click this little box to fix the issue! This box pops up to let you locate where the photos were moved to. 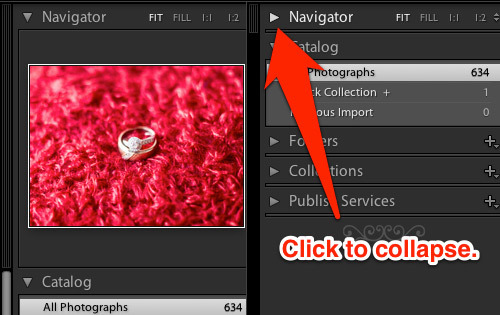 Lightroom pops open this box to allow you to locate where the files are moved to. Finally, show Lightroom where the photos are moved to, and click the same image that you are locating. Leaving the “find nearby missing photos” box checked will help the rest of the images automatically fix. If you don’t know what you did with the files, that’s a little trickier. The best thing I can recommend is searching on your computer for those files. For instance, I could use Windows or Mac’s search tool to search for IMG_2266.CR2 for the example above. 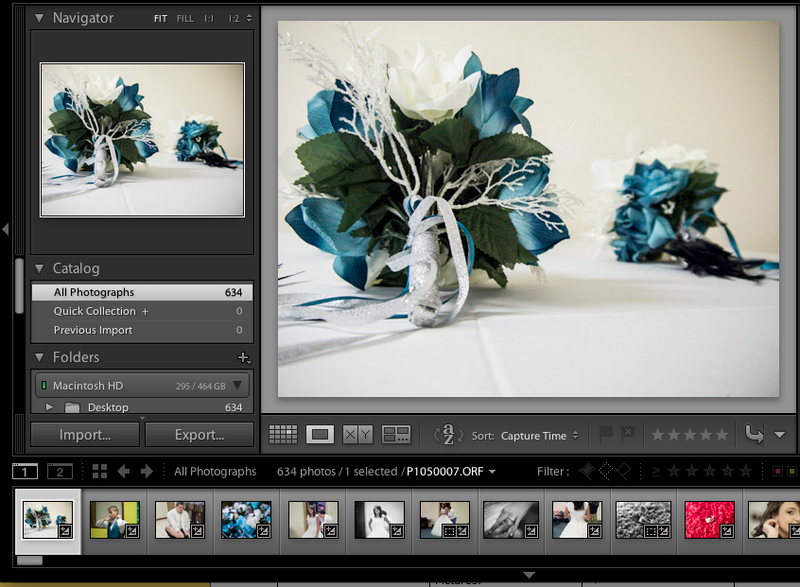 Lightroom also has a super cool feature that lets you filter all of the missing images quickly. While in the Library module, just choose Library from the menu, then Find Missing Photo. Lightroom will show you all of the images that have broken links. 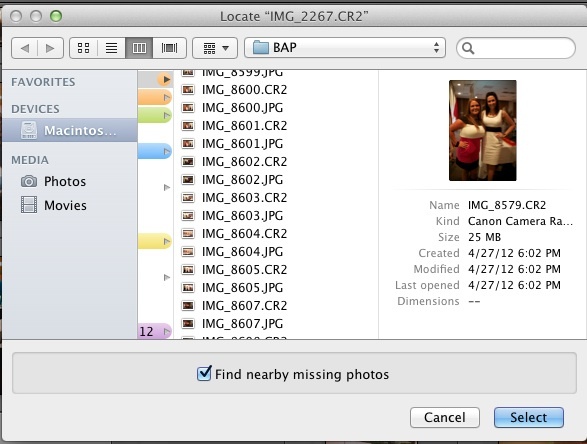 Using “Find Missing Photos” can quickly show the missing photos in your catalog. Having issues with missing images? Check in with a comment if you need help. Renaming photos is an important part of keeping my image names sane! It’s so much nicer to come out with “jones-wedding-01.crw” instead of DSC170439182342 when we’re finished. 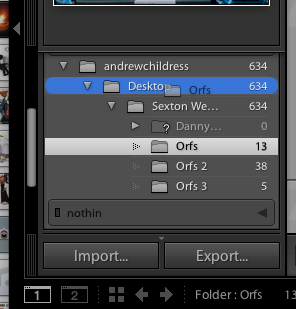 Sure, we can rename photos as we import them into Lightroom. However, how can we rename photos that are already in our catalog? Let’s take a look. 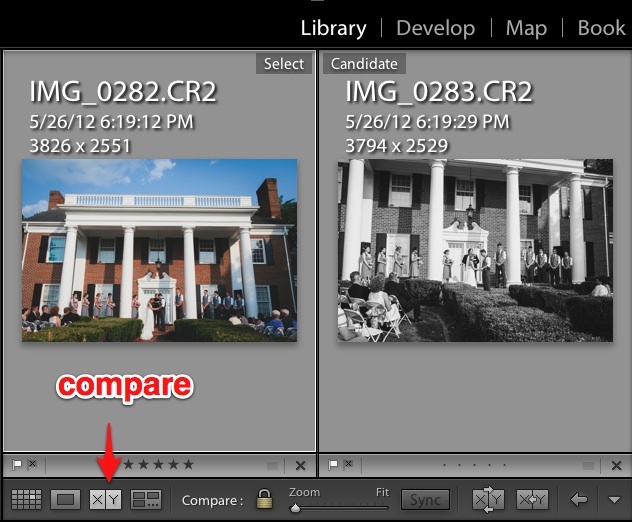 Quick note here: I frequently talk about the beauty of Lightroom not altering our original files. This is one of the tweaks that actually does alter your source files. Of course, just changing the filename is pretty harmless, but just thought you should know. The beauty of renaming the files is that we basically give Lightroom a “naming scheme” and then it handles renaming them all for us. To get started, go ahead and make sure you’re in the Library module. Next up, pick the photos that you want to rename. Typically, I’ll want to rename all of my photos, so I select all. Next up, bring up Lightroom’s rename option by pressing F2 on your keyboard, or choosing “Library” from the menu, then “Rename Photos”. 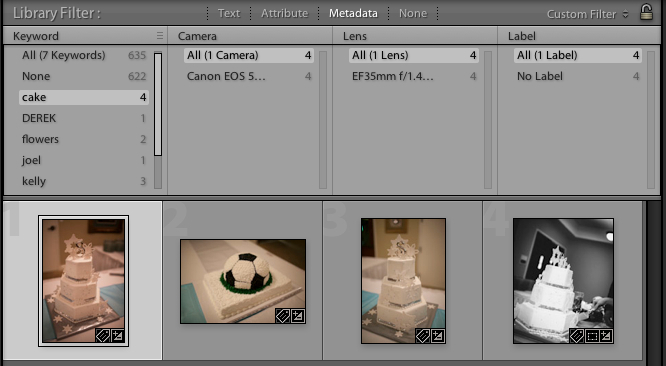 Now, Lightroom brings up a menu that lets us choose the way that we rename our photos. Typically, I keep it pretty simple and choose the option that reads “Custom Name – Sequence”. Let’s take a look. Here, all that we have to do is enter our “custom text”, which is the text that appears in every filename. Then, Lightroom adds a number to the end of each photo in order. We can also start the numbering wherever we want, but I usually leave it at “1”. But what if we want to get more detailed than that? We can create custom settings and naming schemes to build much more descriptive names. 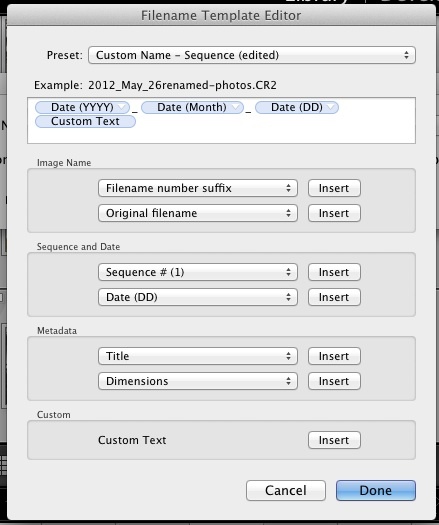 Instead of choosing “custom name-sequence” from the menu, now try opening “Custom Settings” on the File Naming menu. 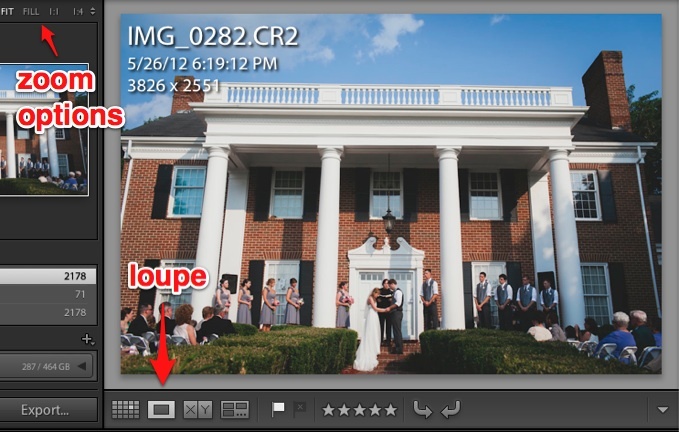 Okay, this is one of the most complex parts of Lightroom but bear with me here. Basically, this is a small program within Lightroom that lets us build different naming schemes easily. You can see tons of dropdown menus. This is one thing that takes a little bit of experimenting with, but the basic procedure goes like this. Those dropdowns have different naming options built in, and we chain them together to build our new naming scheme. What we can do is pick naming “bits” from those options and then “insert” them into our naming scheme. You can see that my naming scheme is pretty much based around the date, but there are tons of other options built into that editor. I also added some underscores between the pieces to make the filenames more readable. Renaming photos can be really simple and straightforward, but Lightroom also has tons of options to build the rename scheme that we desire. If you need something simple, try out one of the built in naming schemes, but also check out the more complex options that can give you detailed names. Do you do image renames? Feel free to leave a comment if you need more help or want to share you preferred naming schemes. Once we get our images tagged, the next logical step is learning how to filter and find images by those keywords. Let’s go back to the cake example that we applied yesterday. 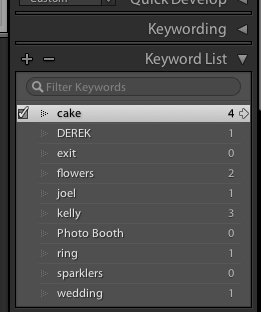 If, for some reason, I want to find all images with the keyword cake, I’ll navigate to the Library module. The first thing that I want to do is turn on the Filter Bar. To do this, let’s go ahead and go to the View menu, and choose Show Filter Bar. You can also press the “\” on your keyboard. 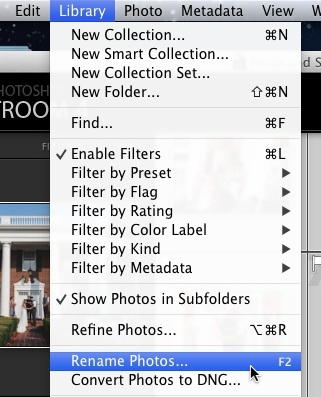 The Lightroom filter bar lets us apply “filters” to narrow our image selection down. Today, we’re just concerned with filtering by keyword, the option on the far left. Clicking on any of those keyword names will narrow our images to JUST the images with those keywords. Okay, done! Now, we’re seeing images with cake as the keyword. This is a great example of how we can use keywords to refine our image selections quickly. If we want to leave this filter, just choose “All” from the list. On the right side of the Library module is another way to filter image by keywords. This is called the Keyword List panel. It shows the keywords of all of the images we’re working with. The number to the right of each keyword shows how many images have those keywords. Hover over a keyword and click the arrow on the far right to filter by keyword. Another way to filter is using the Keyword List panel in the Library module. First, hover over a keyword, and then click the arrow to the right of the keyword. In the last two posts, you’ve been introduced to the power of keywording. Once you’ve taken the time to add keywords to your images, you can navigate and manage your image collections so powerfully. Are you using keywords or will you start now? Feel free to leave a comment so we can share ideas on how to use keywords powerfully. 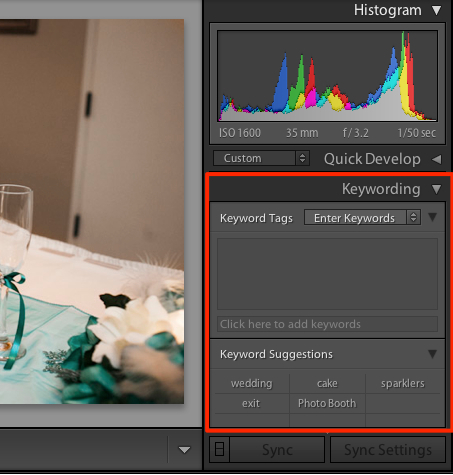 Keywords are one of the most powerful tools that Lightroom offers to help us tag our images. When we have thousands of images and need to find a few in particular, we rely on the keywords we’ve added to our images. Keywords are going to be especially useful once you start working with “big” catalogs. The more images that need to be handled, the more data that we need to help find the ones we’re working with. Let’s work through a quick example of how keywords are used in my workflow, and we’ll use a wedding catalog as an example. The keyword panel is in the Library module, on the right side below the histogram. We’ll start small with a keyword like “cake” . Let’s go ahead and add the tag cake to our image. In the box that reads “Click here to add keywords” to add our keyword. Type in cake , and once we click away from the Window, it will move to the box above. That shows that the keyword has been added to the image. Once you enter your keywords and click away, the keywords are applied to the image super easily. Notice that you can add a comma after a keyword and keep entering more keywords with commas separating them. Also, there’s no limit to the number of keywords that can be added to an image. If a picture has a cake and the couple, don’t be afraid to add that cake keyword, plus “bride” as a keyword, and “groom” as a keyword after that. Separate each keyword with a comma, and you can add them easily. The Keyword Suggestions box shows keywords that we’ve used for other images. We don’t have to type them again, because we can just click them to add them to our image. In our next post, you’ll see the real power of keywords as we learn how to find images with shared keywords. How are you using keywords? Do you have ideas on how you might get started with them? 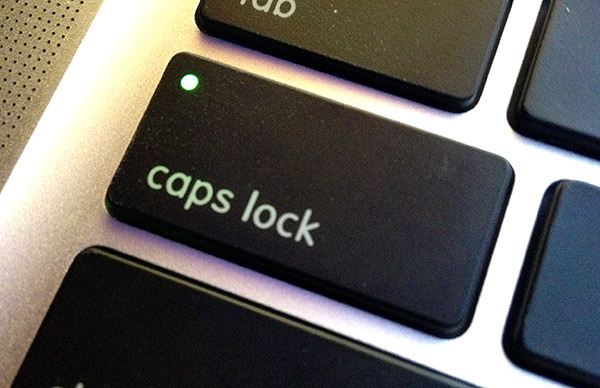 Leave a comment and share your ideas on how keywords will charge up your workflow. Flagging or Stars: Which should I use? Choosing flagging or rating with stars really causes some Lightroom users to question how best to handle their culling. I just can’t choose between stars and flagging as picks while culling my images. I like flagging because it keeps it simple, but I love being able to jump to the best photos by filtering by stars. Help Lightroom Love! Tell me what to do! As is the case with many posts here on the blog, I can only share my own personal preferences and opinions. For me, I prefer flagging photos while culling. In my workflow, there are only two types of photos: ones I will deliver to a client, and ones that I will not. And besides, deciding if a photo is a 3 star or 4 star effort is just a headache for me. I like keeping things straightforward. However, I also see great use for the star system. I might 5-Star an image if I use it in Facebook sneak peeks or for promotional purposes. As always, don’t follow rules that don’t exist – no one says you have to use exclusively flagging or exclusively stars to cull images. Either way, Lightroom provides us with the flexibility to filter images later based on if images are flagged or not, or by the star rating an image receives. We can also throw in color labels for a bit of complexity. Let’s also use this as an open mic: which system do you use to cull? Check in with a comment – I’m really interested to hear what you’re doing. One of the cool features of the Library module is that we have four different views for checking out our images. The default view for me is Grid view, but we can easily switch among four options: Grid, Loupe, Compare, & Survey. To change the view, make sure you’re working in the Library module, and switch among them using the buttons to the lower left of the photo area. Grid view is one that you’re probably pretty familiar with. It’s handy to flip through photos or check out many photos at the same time. Also, if you want to fit more photos into your grid view, use the thumbnails slider to decrease the size of the thumbnails in the grid. If you want larger previews, just push the slider to the right. Pressing “E” or clicking the “Loupe” button enters loupe mode, an option that allows us to more closely examine a single photo. We can use any of the zoom options from the navigator to zoom in, or just click on the photo to do the same. Press the compare button or “c” on the keyboard to enter the compare view. In this view, we can select two photos to compare. 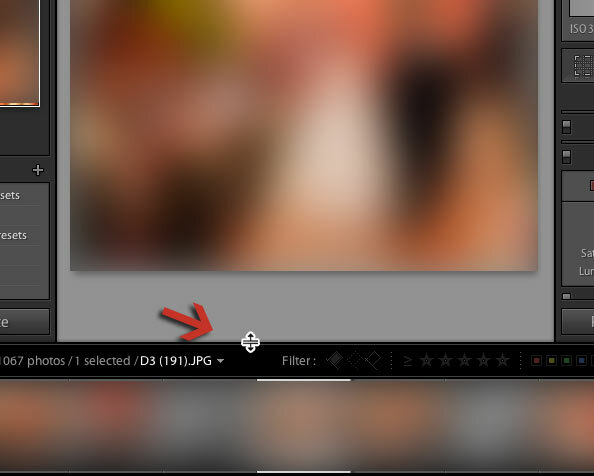 Do this by clicking any photo on the film strip to select the “select” choice, and then holding control on your keyboard and pressing another thumbnail to select the “candidate”. There are also two small buttons labeled “X -> Y” below the image view. You can click these to swap the “select” photo with the “candidate”. This is super handy if you need to choose between two photos and need to choose the final photo to process or deliver. 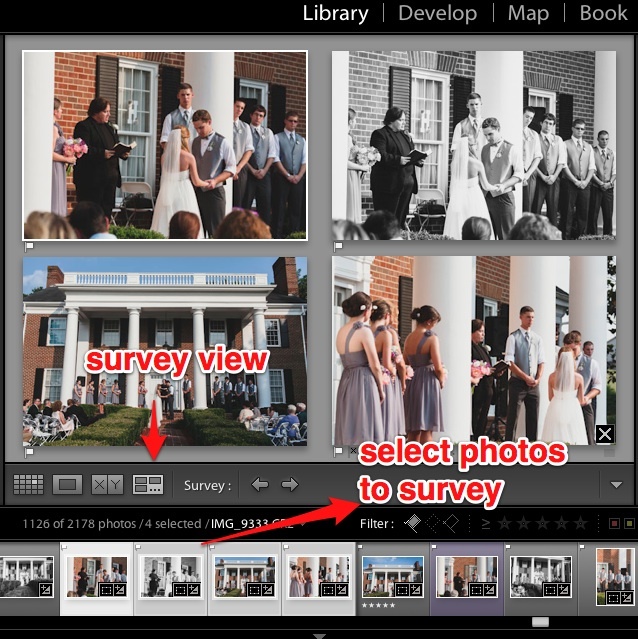 Survey view is a fantastic way of selecting the photos you want to work with too. The cool thing is that we can feed as many images as we want into survey. First up, select the photos you want to survey in the film strip. Remember that we can hold control (command on a Mac) on our keyboard and click as many images as we want to survey them, or shift click a series to select all consecutive images. Below, you can see that I’ve selected four images to enter Survey view with. When you need to get through and select images effectively, the Library module is the place to be. Even more powerful are the four views – grid, loupe, compare, and survey – that it has to offer. We can so effectively scan the images and work through them with these four different views. Which view do you like? Let me know what you think with a comment. If we’re going to spend lots of time in Lightroom (and I bet that we will), we might as well customize it just the way we like, right? 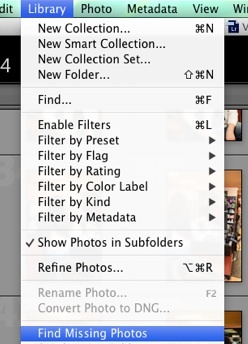 Lightroom has a pretty good number of options that I’ll show you below to set it up just the way you want to see it. 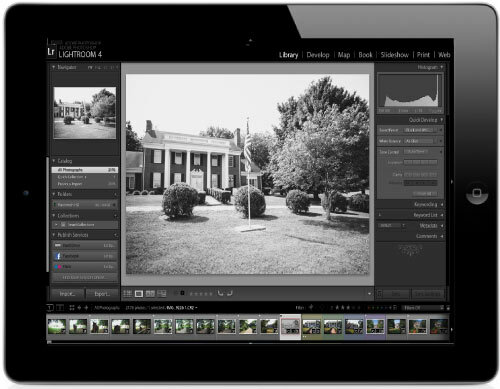 Today, we’ll show you how to change the look of Lightroom. 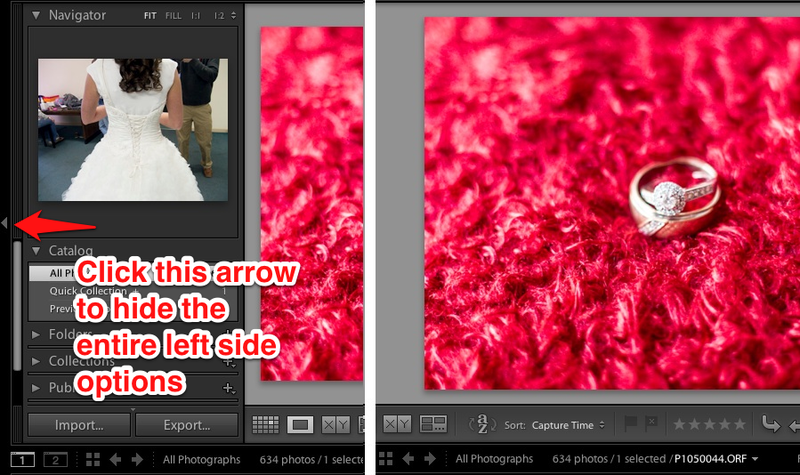 Arrows are your friend when it comes to customizing Lightroom. 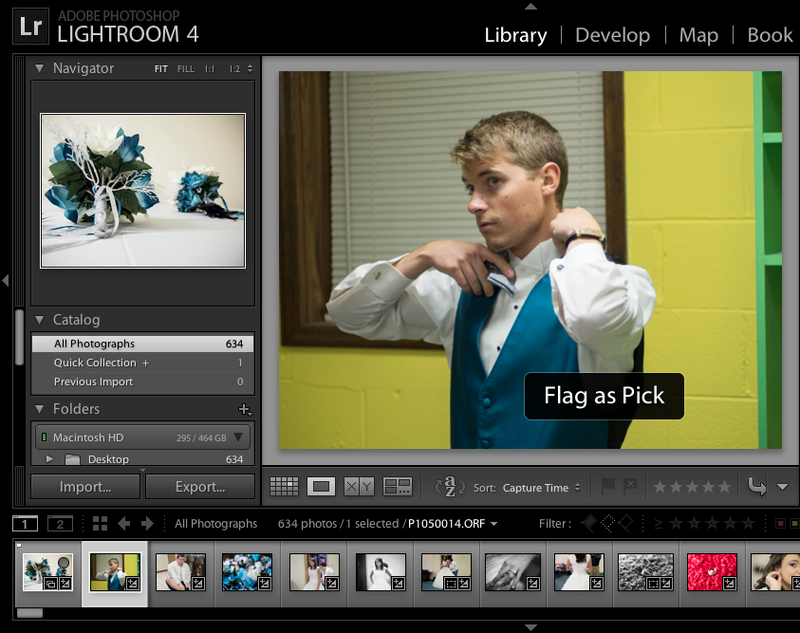 When we click arrows, we change the way that Lightroom displays itself. Let’s take a look and use the Library module as an example. In the screenshot below, you can see how clicking the arrow to the left of “Navigation” causes that panel to disappear. You can use this with any panel to hide it and give you more room to work. Clicking any of the arrows next to the panel will collapse that panel. I like to have only the panel I’m working with open to keep my workspace minimal and clean. 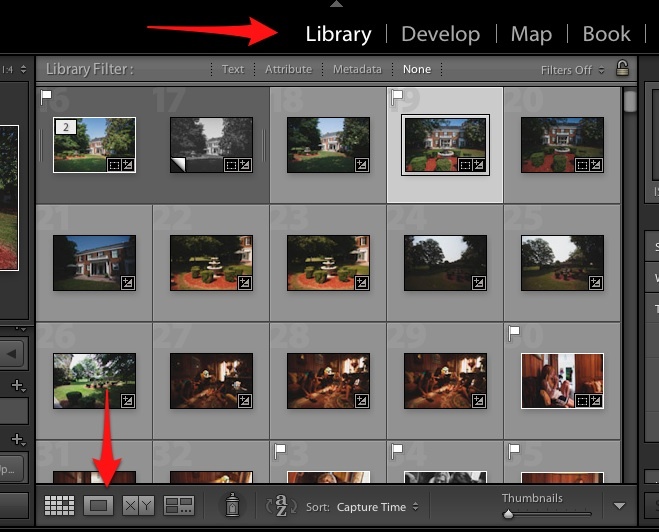 Beyond the individual settings panels, you can hide entire sides of Lightroom by clicking the arrows on the far left and right of the application. Clicking the arrow on the far left side of Lightroom will hide the entire left side of the program, giving you fewer distracitons and more room to work with your images in the workspace. Finally, you can also drag the separator of the filmstrip at the bottom to show larger or smaller previews. You might as well get comfortable in Lightroom. Once you learn to love it, you’ll spend so much time in it that you will want to customize it to your liking! 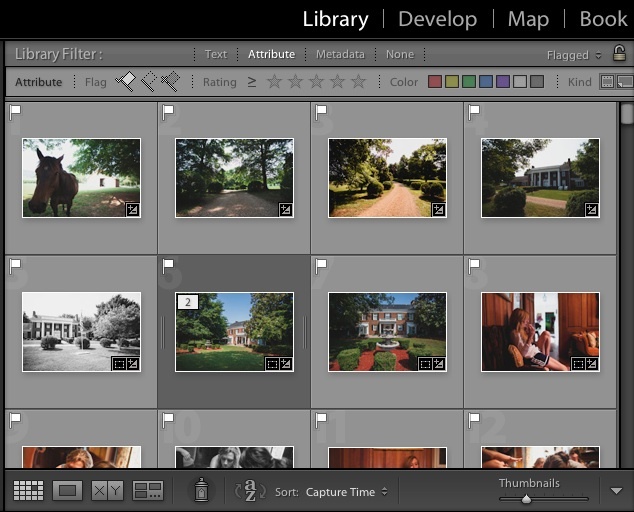 Do you customize the view of Lightroom? Feel free to leave a comment to let me know how you set up your view of the program.